As I posted on Facebook about the upcoming news for NBA 2k17, 2kSports just published a note about enhancements in MyGM and MyLeague modes of NBA 2k17. Also, the standalone Playoffs mode has returned. 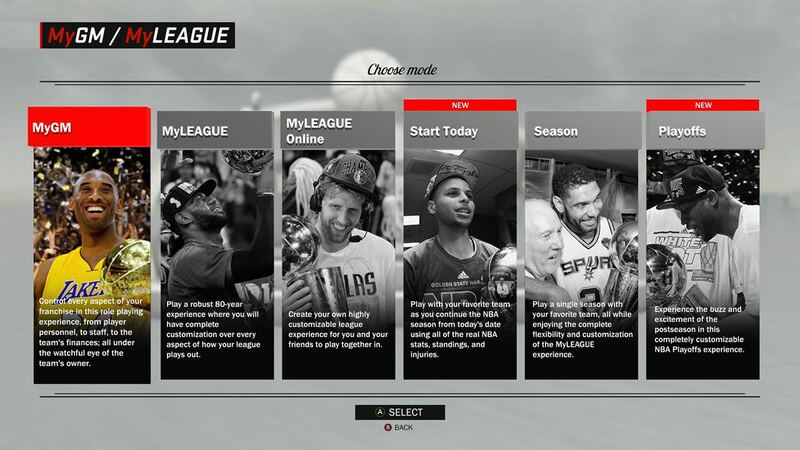 The League Expansion feature allows you to create a league with up to 36 teams (with 6 teams being Expansion teams). For those wanting to exert more freedom, Custom League allows you to create a league with a mixture of Current NBA Teams, Classic NBA Teams, Expansion Teams, and Euroleague Teams. Start with the current 30-team NBA, as it is structured now. Start a league with Expansion where you can instantly expand the league from 30 up to 36 teams (all with designs of your choosing). Or, you can start with a completely customized league (that can still include up to 36 teams) that may include realigned divisions, Expansion Teams, Classic teams, Edited/Rebranded NBA teams, Euroleague teams, and more. A considerable amount of time was spent this year building an NBA schedule creation tool that dynamically generates balanced schedules with respect to your 31/32/33/34/35/36 team leagues. We then created dynamic menus for every menu in the game including the Draft Lottery and the Draft, with respect to how many teams are in the league. For example, when you have a 32-team league, that means you now have 16 teams in the lottery (up from the current 14), and all the mathematical odds of getting the #1 pick that go along with that new Draft Lottery format need to be updated. You can browse Team Designs that other community members have uploaded. With only the press of a button, these Team Designs can easily be downloaded an inserted directly into your league. League Expansion isn’t just a feature you can use when setting up your league. You can dynamically expand your league in the off-season, even after the mode has already started! Additionally, the league will approve expansion franchises dynamically on its own as you get further into your franchise. When that happens, you’ll need to make tough decisions about which of your players you want to protect, and which will need to be exposed for the impending Expansion Draft. It won’t happen very often, but when it does, it will shake up your league, without a doubt! 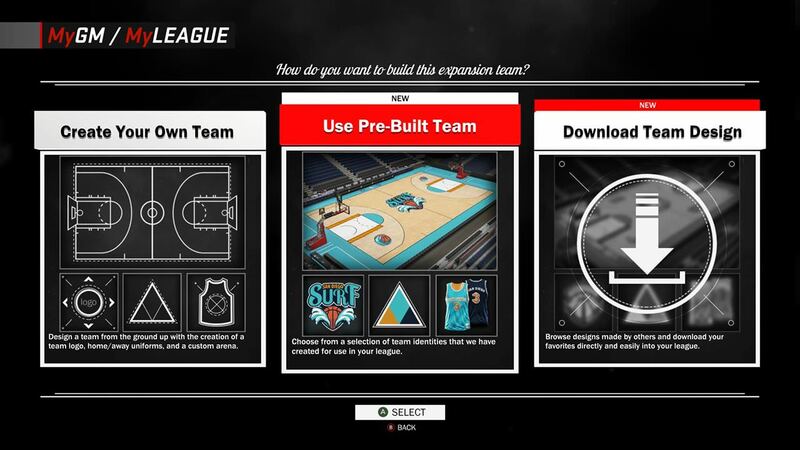 For the MyLEAGUE users out there, you will have the ability to contract previously expanded expansion teams, should you choose to do so. There’s no word yet on what kind of features MyLEAGUE Online will include compared to its offline equivalent, but more details will surely be coming soon. MyGM/MyLEAGUE has seen a LOT of great additions this year; We’ll get into the rest of those details a little closer to launch. 2K is always looking for ways to innovate in the franchise space, and following on the heels of Team Relocation in NBA 2K16, League Expansion feels like the natural evolution moving forward with NBA 2K17. 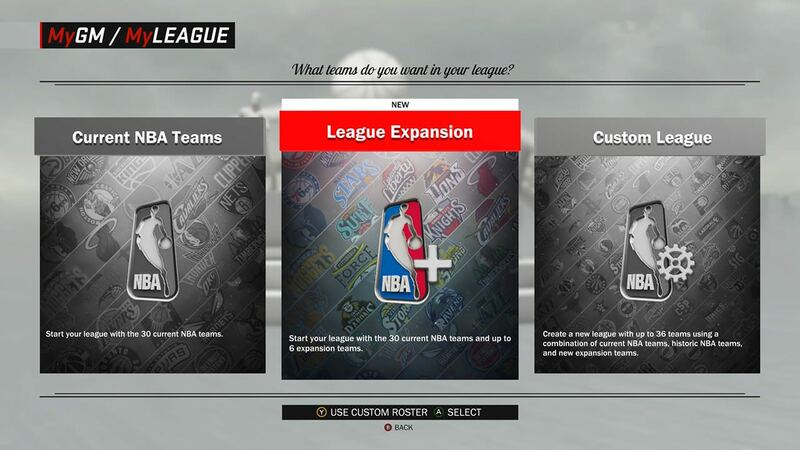 Let us know below how you plan on using the League Expansion feature. We’re excited to hear what everyone’s plans are!